Home › News › What are your key priorities for your digital transformation? Digitization is not new and we all know big ‘digital’ companies like Google, Facebook, AirBnB and Uber. But digital innovation is transforming or even disrupting more and more industries and quick adaptation is vital. With the threats arrive the opportunities: digital innovations also offer tremendous opportunities for new business development. 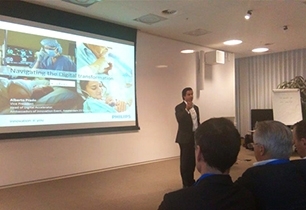 In a recent survey, conducted among a group of innovation leaders in the Netherlands, 83% see digital innovation as a top 3 strategic priority, of which 13% see it as the most important strategic priority. Even more, over two-third of them expect an increase of at least 10% in digital innovation effort (budget), of which 38% expect it to be more than 25%. With other words: digital innovation is seen as a high priority. How can I go digital, fast? Setting priorities is one, but what’s next? 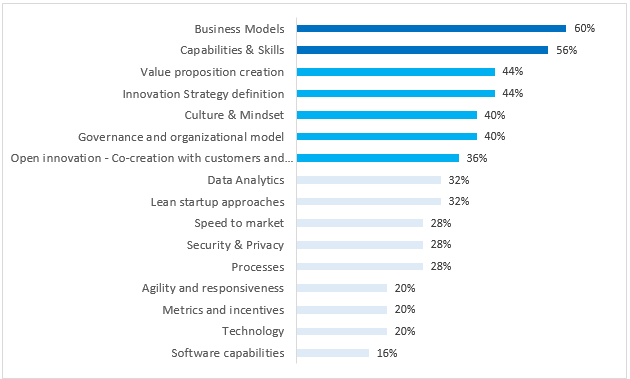 Upon asking innovation leaders in the same survey what their key priorities for the coming 12 months are, they indicate three important elements when starting new digital innovations. First, develop new value propositions -how to generate value from data and for whom- as well as new business models, and do that in co-creation with customers and others. Second, as important are the people involved: capabilities & skills and culture & mindset are also key priorities to start working on. And third, give guidance: a clear innovation strategy (where to innovate) and an adapted governance and organizational model are crucial for a digital transformation. Take a start-up approach to innovation; digital innovation, prototypes and concepts should be tested and validated without overinvesting initially. The lean start-up approach, with fast iterations, rapid prototyping and quick testing of hypotheses, instead of long internal development cycles, is best suited for innovating in the volatile and uncertain environment that characterizes digital innovation. For instance use “hackathons”, a highly focused “pressure-cooker” activity, e.g. to get from idea to a prototype (that can be used to confront users) in less than one week. Also, learn from the entrepreneurial approach of start-ups: developing and testing new concepts with limited time, budget and resources, can be of great inspiration for your digital innovation practices. Large companies need to learn better how to collaborate effectively with start-ups to co-create new innovation. Attract new talent that shares the company’s passion; attracting new talents is important for every organization, but it is crucial in order to execute a digital transformation of any traditional enterprise. Younger generations are often driven by unconventional thinking, entrepreneurial attitude and a digital mind-set. They can challenge assumptions and ‘implicit’ rules of your business. Beyond this, individuals with the relevant software innovation skills, are indispensable to identify and realize the potential of digital innovation. Explore & adopt new ways of business value creation; digital innovations are radically different from one-off selling of a product at a certain price. Ultimately, the value and ability to monetize data is the determining factor in creating differentiating digital propositions. And revenue streams can be totally differently, like freemium, pay for use or subscription models. This means totally new business models should be explored to find the right way to create value for your company. All in all, digital transformation is a vast challenge offering enormous opportunities for many companies. An important lesson from Darwin applies here as well: ‘only those who adapt to their changing environment will survive’. Share your thoughts with us by getting in touch with our consultants directly.